Gallery 80808 is thrilled to present CATS ON A LEASH: THREE DECADES AT PLAY featuring work by Jeri Burdick, Clay Burnette, Clark Ellefson, Heidi Darr-Hope, Judy Hubbard, and Lee Malerich from Friday, October 26 through Saturday, November 3, 2007. There will be an opening reception on Friday, October 26 from 5 – 10 PM. Additional hours are: Weekdays from 11 – 2 and Weekends from 1 – 5. More than 580 exhibitions nationally and internationally. More than 35 grants and fellowships awarded. More than 200 books, magazine and newspapers articles. More than 75 commissions from corporate and private collectors. More than 250 workshops and lectures. More than 85 active memberships on boards and committees. This show is a retrospective of six of the original Cats on a Leash members who gathered in 1985 to discuss joint marketing of artists in South Carolina. Their first exhibition opened in 1987 at GMK Associates, an architectural firm, in Columbia, followed by a showing at Gallery 300, in 1988, in Atlanta, a group show at Carol Saunders Gallery, Columbia, in 1990 and a major show at the Columbia Museum of Art in 1993. The selected artists each had a piece purchased for the museum’s permanent collection from that exhibition. 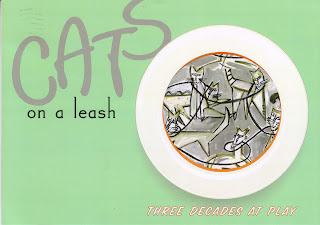 Although the Cats have not exhibited as a group since 1993, the individual members remain committed to their own personal art careers. A synergy has developed as a result of their individual accomplishments and a reciprocal respect for each other continues to serve as an impetus for the collective future of the group. These Cats creat powerful, detailed, whimsical craft. They are magicians with wood, pinestraw, clay, yarns, fabric and paint. They are driven, talented, multifaceted, political and potent. They are weavers of tales, chroniclers of our times, and preservers of indigenous traditions. They don’t settle. These Cats produce intricate installations, functional accessories and sacred reliqueries. And, they also have supported and funded artists and arts organizations statewide; helped heal wounded bodies and spirits; spawned a cultural corridor for the capitol city; established and managed businesses; and set a standard for proactivism in the arts and community that is pervasive and laudable. Cats on a Leash artists are charismatic, creative changlings who produce consistently professional, collectable craft. They reinvent themselves often as a lifechoice. The breadth and depth of their body of work has been significant for three decades – with no end in sight. 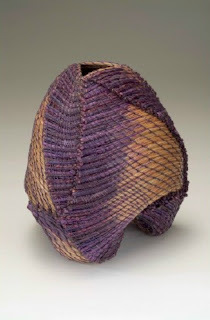 The exhibition will include unique pine needle baskets (as pictured here, both above and below) and handwoven scarves by Clay Burnette. Clark Ellefson’s work will include furniture and lighting. Judy Hubbard will display silk batiks and assemblages. Above is a detail image of one of Heidi Darr-Hope’s work. She will be showing a variety of photo montages and mixed media reliquaries. 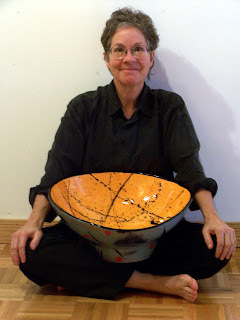 Above is Jeri Burdick with one of her ceramics. Her work is also pictured on exhibition invitation, which is the first image on this entry. Jeri will be showing both two and three dimensional work. Above is one of Lee Malerich’s stitched drawings. In addition to her embroidery, Lee will be showing found art objects. Below is additional, biographical information and abridged statements for the participating artists. 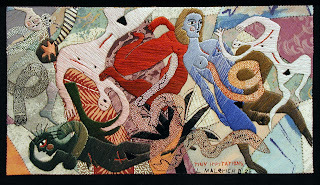 Selected Exhibitions: painted and tiled murals, 17 schools in North and South Carolina; Exhibitions: American Craft Council, Piccolo Spoleto, Blue Spiral Gallery, Houston International Festival, Philadelphia Museum Craft Show, Atalaya Craft Show, The American Artisan Show and over 80 other venues. SC Arts Commission Craft Fellow, 1985. Education: AS degree in Retail Management in 1979, a BA in Interdisciplinary Studies with concentration in Marketing and Art Studio in 1982, and a MA in Library and Information Science in 1999; all from the University of South Carolina. Professional Experience: Clay is Director of Grants and Fellowships for the SC Arts Commission and maintains a fiber studio. The White House Christmas Tree Ornament Collection, Southern Accents Magazine, Mint Museum of Craft and Design, Springs Industries, Binney & Smith, Inc., and numerous others. Exhibitions:2008 Tradition/Innovation: American Masterpieces of Southern Craft & Traditional Art, Southern Arts Federation, Atlanta, GA (will tour southeast for two years), Ohio Craft Museum, Bascom-Louise Gallery, Highlands, NC, American Craft Council, McKissick Museum, SC State Museum, National Basketry Organization, Columbia Museum of Art, Sumter Gallery of Art, Baskets by Master Basket Weavers Billie Ruth Suddeth and Clay Burnette – Summit One Gallery, Highlands, NC, South Carolina State Fair, Blue Spiral Gallery, SOFA – New York and Chicago, Ogden Museum of Southern Art, New Orleans, American Art Co., Takoma, WA, Contemporary International Basketry – Manchester, England (traveled the United Kingdom 4/99 – 9/00), Piedmont Craftsmen, Craft Alliance, St. Louis, Smithsonian Craft Show, and more than 130 other sites. 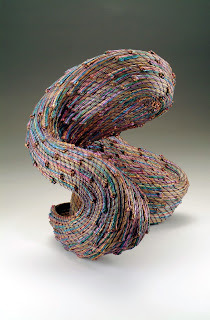 Selected Exhibitions: American Craft Council, New York Gift Show, Gibbes Museum of Art, Folk Arts Center, Asheville, American Furniture Designers, Switzerland, International Contemporary Furniture Fair, Victoria and Albert Museum, the Chicago Art Institute, and more than 70 other showings. Corporate Collections::Home Box Office, Atlanta, GA, Convex Co., LTD, Hong Kong, Coca Cola USA, Bogner GmbH, Munich, Germany, Madeira Threads LTD- USA and UK, Textilforum Magazine, Hannover, Germany, Waelkens, Oostrozebeke, Belgium, NCNB Corporation, Columbia, SC, Sin Woo GMT, Seoul, South Korea, Marriott Corporation, Orlando, FL, and more than 25 others. 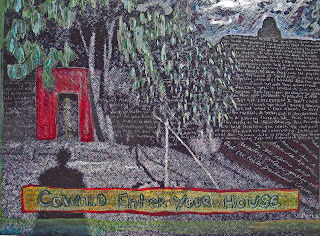 Selected Exhibitions: University of Georgia, Spirit Square Gallery, Charlotte, Winthrop University, International Gallery, San Diego, CA, and museums/galleries in Virginia, Pennsylvania, Illinois, North and South Carolina, Germany, Italy, Canada, among over 90 addditional sites. Notable: Co-author of Art and Healing; Sometimes Words Are Not Enough, Healing Icons Art Support Program for Patients with Cancer; recipient of 8 Special Project Grants and a Craft Fellowship from the SC Arts Commission. Selected Exhibitions: State Art Collection Retrospective, Gallery 80808, SC State Museum, Upstairs Gallery, Tryon, NC, USC-Sumter, Richland Memorial Hospital, Francis Marion College, Clemson University, Piedmont Craftsmen, Guild of SC Artists, and museum and galleries in Georgia, North and South Carolina, Pennsylvania, and California, among almost 50 venues. Selected Exhibitions: Ormond Beach (Florida) Museum, Kentucky Museum of Art and Craft, NC Folk Arts Center, The NIH Clinical Center Galleries, Ohio Craft Museum, Crafts Council of England, Mayo Clinic, Washington Craft Show and over 190 others. 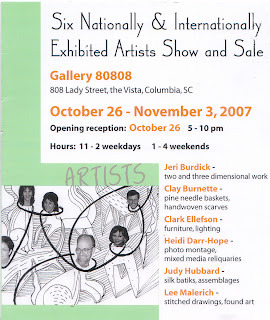 Notable: Work has been reviewed or printed in over 100 publications; she is included in the collections of The Museum of York County, Tree of Life Congregation, Columbia, Walton Rehabilitation Hospital, Augusta, Georgia, SCANA Corporation, Columbia, Sun Printing, Inc., Orangeburg, South Carolina National Bank, and dozens others. Free parking for this art event is available after 6 PM and weekends in the city owned lot diagonally across Lady Street from the gallery….though entrance to the lot is off Washington Street. To visit the Gallery 80808/Vista Studios website, click here.